Stephanie du Plessis recently joined WearCheck’s Richards Bay team as a vibration analysis technician. In 2016, Stephanie was the recipient of the Top Scholarship award, winning an international scholarship from Mobius. Through this, Stephanie completed her CAT-1 course, and is now undergoing training for her CAT-11. This is the first time in history that international training institute Mobius has offered scholarships, and it came along just in time for Stephanie. She had borrowed the vibration analysis text book from a friend and was trying to teach herself while saving up to pay for the course. Stephanie applied for the Mobius bursary, which was offered to students around the world. Out of 330 global applications, Stephanie was selected. Not only that, she won the top award, which enabled her to attend an IMVAC (International Machine Vibration and Condition Monitoring Conference) in Dubai this year. 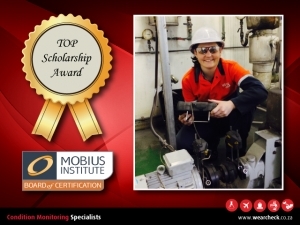 Top Mobius scholarship winner Stephanie du Plessis has joined WearCheck Richards Bay as a vibration analysis technician. The following positions are now available in Isando, Gauteng. Laboratory Assistant: WearCheck Specialty Laboratory, Isando, Gauteng. To ensure that all samples received at WSL are analysed accurately and timeously according to IS0 9001:2008 and ISO 17025 policies and procedures. Ability to utilize computer software programs, including database programs and spreadsheets. 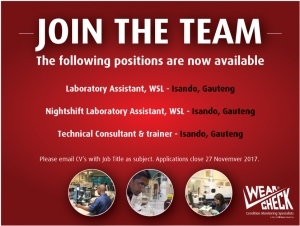 Nightshift Laboratory Assistant: WearCheck Specialty Laboratory, Isando, Gauteng. Technical Consultant & Trainer: WearCheck, Isando, Gauteng. Based in Isando, and reporting into the Sales Manager, the suitable candidate will join a dynamic team in a high-paced environment. Providing technical support and advice to customers with regards to their lubrication and oil analysis programmes, as well as assisting with the interpretation of their oil analysis reports with respect to their particular environments. 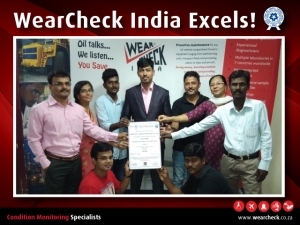 Development and presentation of the WearCheck training courses in both public seminar and onsite environments. Degree or diploma in mechanical engineering or qualified diesel fitter or recognised mechanical apprenticeship or government trade test. Physical science at Matric (Grade 12) level. At least two years full time experience either working with oil analysis or, ideally, having worked in the field of oil analysis diagnostics. Desirable qualities: Excellent presentation skills, Good interpersonal and communication skills, team player, relaxed, inquiring and analytical mind, sense of humor, responsible, accurate, attention to detail, computer literate, decision maker, trouble-shooter. If you have not received a reply regarding your application by 8th December 2017, please consider your application as being unsuccessful. Angola is the next frontier across which WearCheck is set to expand, when Cummins Angola becomes the first local WearCheck agent, based in Luanda. Global power leader Cummins recently sent staff from their Angolan branch to WearCheck Pinetown in South Africa to attend a three day oil analysis training course. The Cummins delegation also met with the WearCheck Pinetown team and toured the laboratory, in preparation for their rôle as agents for the company. Cummins and WearCheck intersect on many levels as they operate in the same industries, albeit supplying different services. While WearCheck specialises in condition monitoring, Cummins Inc. designs, manufactures, sells and services diesel and alternative-fuelled electrical generator sets and related components. Cummins Angola will serve as a depot where WearCheck kits can be purchased, and samples can be dropped off. Samples will be sent to a WearCheck laboratory, and diagnosis and results communicated directly with the customers. Kits are available in both Portuguese and English. 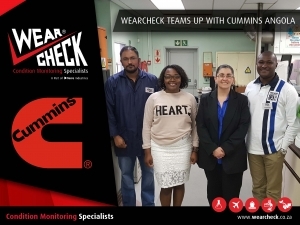 Cummins Angola, set to become WearCheck agents shortly, recently visited WearCheck Pinetown. Seen in the laboratory are (from left to right) Meshach Govender (lab manager), Ines Miguel, Steven Lumley (WearCheck technical manager) and Madeira Domingos.